The American government is confident that the Cuban authorities will keep their word and release more political prisoners, said Mr Schultz. 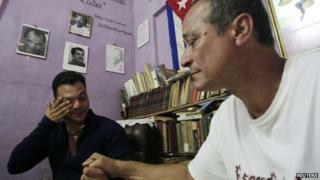 Twenty-nine of the activists released since Wednesday are from the dissident Patriotic Union of Cuba (UNPACU). "Our freed prisoners are committed to continue fighting for the democratic Cuba which we all want," the group's leader, Jose Daniel Ferrer, said in a statement. "The UNPACU activists have left prison with more energy, force and motivation than they had when they were jailed." On Thursday, the US announced that Assistant Secretary of State Roberta Jacobson would lead a delegation travelling to the capital, Havana, later this month. The US Department of State said the talks - to take place on 21 and 22 January - will focus on migration. But they will also discuss the practicalities of reopening embassies in Washington DC and Havana, said the Department of State. The rapprochement process was announced by US President Barack Obama and his Cuban counterpart Raul Castro on 17 December. President Obama's proposal to restore relations still needs to be approved by Congress, where it faces opposition from many Republicans and anti-Castro lawmakers. The US says it will continue to push Mr Castro's government to respect human rights and the freedom of speech. Senator Marco Rubio, a leading critic of the president on the Cuba question, and other Cuban-Americans in Congress have argued that Mr Obama's change of policy could provide legitimacy and money for the Cuban government while it continues to violate human rights. Last week, the Cuban authorities detained several high-profile dissidents who were planning to stage an open microphone protest in Havana's Revolution Square. The US Department of State issued a statement saying it was "deeply concerned" by the reports. The activists were eventually released.